Supporters of Neil Abercrombie and James “Duke” Aiona are circulating a lot of garbage about the opposition online, but the Republicans win the prize for the most odious piece of opala officially issued by the candidates or parties in this campaign. 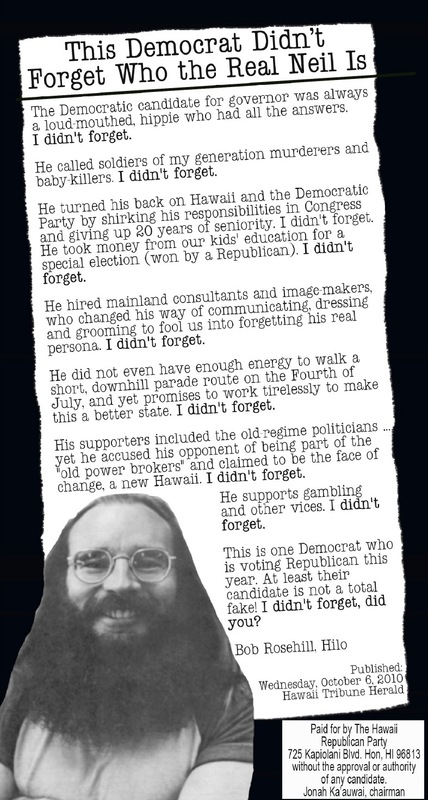 A Republican Party ad in today’s newspaper calls Abercrombie “a loud-mouthed hippie” and includes a 40-year-old photo. The dubious facts and offensive tone are reminiscent of the “Compare & Decide” mailer that helped sink Mayor Mufi Hannemann in the primary — and I have a sneaking suspicion that it shares some of the same origins. GOP chairman Jonah Kaʻauwai was boasting about it in advance on a Republican-friendly website that features National Enquirer-style headlines throwing everything from Nazis and slavery to marijuana and birthers at Abercrombie. This entry was posted on October 31, 2010 at 3:19 pm and is filed under Volcanic Ash. You can subscribe via RSS 2.0 feed to this post's comments. The polls must show Abercrombie way out in front. Aiona is going to lose and he knows it so he and Jonah go looking for a Hail Mary (pun intended)and the best they can come up with is this? It is no wonder the Republican party is dead in Hawaii. So this is SOP for GOP’s campaign yes? The polls show Aiona is going to lose. In this case they must show him to be losing very badly. His advisors tell him he is going to lose unless he does something radical and he listens of course to the stupidist advisor in the bunch who comes up with a brain fart that will stink to high heaven (oops there I go again). It will stink but instead of drifting Neils way the stench will just hang around Jonah and Duke and everyone will know who laid it. This dumb move will cause Aiona to lose by an even larger margin. Get ready for a landslike Neil. Lame. Really lame. This is the party of “values”? This is the party of Jesus? This former Republican has had enough. I do not agree with Neil on many issues, but at least he is a man of principles and character who would never resort to this kind of garbage. The problem is all those Vietnam Vets. We went to school for years to figure out how to lord it over them and now they dare to question The Abercrombie? We must silence the Vietnam Vets. Yes. This GOP ad is MUCH worse than all those videos about Aiona killing gays in Uganda and burning cupie dolls in the Amazon rainforest. The funny thing was when they started saying Aiona was destroying images of Catholic saints…why would a Catholic do that? The party of Jesus? Really? Jesus has no party affiliation. I’ve been listening to & reading the pundits as to their take on Tuesday’s election outcomes in the US Senate and House races. According to them, the Democrats will lose between 40 and 65 seats and the Senate will barely hold onto its Democratic majority – depending upon the TeePee turnout. If they throng to the polls, then DaDonks could lose as many as 15 seats – and we’d lose our Earmark Guy. Guess we should give thanx to The Powers That Be that we live in Hawai`i. Can you imagine putting Big Ban through what other incumbent senators are going through right now. I can understand the nutburgers using these tactics, but people who head major political parties? Will these kinds of attacks have a negative impact on GOP candidates expected to win in some of the State Senate and House races such Virginia Enos in Senate District 25 or Gil Riviere in House District 46? Made In USA by USA dadonks and daelephants too. I don’t think the locals would stoop so low. Not Hawaii born and raised. The locals DID stoop so low. It was the Hawaii Republican Party that paid to run that ad. I agree, Dave. This has the eau de Rollman stink all over it. Is this Bob Rosehill related to Linda Rosehill? Line #1 is racist. What they are really saying is ‘he’s haole’. Actually, more specifically ‘hes a f’n loud mouth know it all haole.’. Why not just say THAT, Mr. Rosehill? Oh, wait, Mufi tried that, didnt he? Didnt work then and its not going to work now. Line #2 is probably the most dramatic and alarming – but Im glad that Jim Loomis is quick to point out its a blatant lie. Didnt Neil sit on the appropriations committee that funded the military? Didnt he help get better armoured vehicles to help protect our men and women? Yeah, its really clear to me that he doesnt think our soldiers are murderers. Line #3 – yes- he left office – what a crime. I was upset too, but I get it – he wanst ready to retire but the guy wanted to come home. This is America, isnt it? So far, looks like he’s made pretty decent career move, dontchathink? Line#4 – Newsflash, Mr. Rosehill: A LOT of people told him to cut his hair. He was turning into an old-guy ready to be on an Oprah-make-over special. So he did. He looks a lot better now, no? Line#5 We have all seen this man in action now. Its obvious to anyone that hes got a fire in his belly and amazing energy. What are YOU doing RIGHT NOW, Mr. Rosehill? Sitting in front of your television, getting older by the minute? Line#6 His supporters included women, young people, old people, japanese, chinese, filipino, haoles, etc. etc.. Old or New Democrats, turns out, they are DEMOCRATS. Line#7 The State of Hawaii subsidizes the State of Nevada. Talk about stupid. WHY shouldnt we examine some tourist related gambling? And I love the ‘other vices’ – is that code for that big bad word ‘homosexuality’? Yes, Mr. Rosehill, we remember how the Rosehills cant stand those little gay and lesbian boys and girls and their ‘vices’. Mr. Rosehill, and if Im picking up on Daves hint – Keith, and Jonah, after debunking every one of your points you sought to raise, I have one message back to you: This is PATHETIC. And sad. You are some sad, angry little boys. You all tried to throw the lowest blows you could think of. Guess what – its not going to work. Not this. Not the lame commercials. Not the seriously lame YouTube videos circulating. You all know Ive said this from the start – campaign on the merits of your candidacy. Campaign on why you should be elected, not why the other guy should not be. Here at the end, Hawaii’s voters are beyond sick and tired of the negative campaigning. Its done nothing but make politicians and the people around them look like sh$t. Republicans win the prize for the most odious PIECES of opala officially issued by the candidates or parties in campaigns over the last DECADE plus. While I know many good and decent conservative/Republican people, whom I work with everyday, what has gone on with the Republican Party is both criminal and treasonous. Sadly, nobody in power has the cajones to call them on this (outside a couple comedians) – to the detriment of Americans, this nation and the world. It appears tomorrow we will again observe the power of Republican deception, lies and distortion of truth: weak-minded lemmings falling prey to the Dark Side like sheep to the slaughter. Wuahahahahaha …. People claiming the statements stated by Bob Rosehill are untrue and outright lies. How do you know? If anyone wants the TRUTH, why doesn’t the media such as the local news stations and the StarAdvertiser go to the Big Island and video an interview of Rosehill and play this interview on the air and on the Internet and let Hawaii resides decide for themselves whether Rosehill is believable or a liar. Of course the local media will not do this because they don’t want to know the truth. They DON’T want to research the answers Rosehill will give such as digging up Abercrombie’s past and asking people who knew Abercrombie in the 60’s and 70’s and hung around Abercrombie while he was a Vietnam war protester living in Hawaii. Also if anyone is so offended by Rosehill’s statements then have Abercrombie file a defamation lawsuit against Rosehill and have Rosehill swear under oath during his deposition on whether he heard Abercrombie at any time publicly state that he thought military personnel during the Vietnam war were “murderers and baby killers” and recount any other personal experiences he has had with Abercrombie in the past. As most of Rosehill’s rants are “opinion,” i.e., “loud-mouthed, hippie,” there are no FACTS. Rosehill’s allegation is UNSOURCED … and, as WE ALL KNOW, this is simply a rogue hit piece. PAU!!! I would like to respond to the numerous innuendos by Shapiro and others that this ad is my work. It is not. At this point, I find all partisan politics to be ridiculous. I recognize the photo in the current ad to be from an Abercrombie political brochure from the 70’s. This was re-published online in Ian Lind’s blog last year…back when it was just funny and not loaded with dastardly political overtones. I was out walking the dog. Almost stepped in some shepherd poop-oooh,that was nasty.Then later I almost stepped in some spaniel poop.Oooh, that was nasty too. Which one was more nasty? Who cares? I don’t even want to know the criteria deployed to determine the relative degrees of nasty. Bob Rosehill was a Hawaii County councilman 1992-94. He is a well-kown Hilo-side Democrat. One pseudonym per customer, please. Those commenting are too young to be in the Vietnam War. Females don’t count since they don’t serve in the frontline. Protesting the War, one should be a Muhammad Ali, who by the way is Muslim. He served time in Prison, lost his world title and then came back and won the World Title back again. Anyone can protest the War but none can Make Fun of an American Muslim who stood his ground. The mistake our Government is making is A Civil War all over again, dealing with 2 parties. Neither one cares for the people they are supposed to lead. Did nobody notice that the original letter was WRITTEN BY A DEMOCRAT???????????????????????????????????????????????????????????????????????????????????????????????????????? Did I mention Republican Party? You did! It was also an ad without the approval or authority of any candidate. Jonah Ka’auwai, Chairman. Could have been anyone with the money to put an ad for us to see. It was Halloween and a Missionary who dressed up as local who did the ad. FYI, if it is the same Bob Rosehill, that Democrat served only one term and seemed embittered by his subsequent failure at re-election. And he wouldn’t be the first former Big Island council member who switched to the Other Side for expediency’s sake. Bob Herkes is another one. True, although Herkes went the other way (became a Democrat). Frank DeLuz is another who joined the ranks of the GOP. There have been very few Republicans on the Hawai‘i County Council, especially from the island’s east side, with James Dahlberg (of the Beamer family) representing Ka‘u in the 1980s being the only one to immediately come to mind. Of course, the County Council went nonpartisan a few years back so now the lines are blurred, to say the least. Current lower Puna Councilwoman Emily Naeole has had the support of many Republicans, some because of her strong religious affiliations. Her would-be successor, Fred Blas, formerly declared himself a Republican, received money from the GOP, ran as such for the 4th House seat in 2008 and appeared ready to do so again this year before pulling Council papers. His appearance at a Tea Party rally a few months ago has voters here guessing. David, by the way, B.J. Reyes wrote the post not DePledge. Happens when you put a rogue Democrat on a DONKING BOOTH. They go DaDonk! I wonder How many Democrats are now T-Party members with Republicans? The Good, The Bad and The Ugly. It’s a bit disingenuous for Shapiro to feign outrage over this ad, given its original author is a self-declared Democrat. Even for the sake of argument, agreeing that it is *the most* “odious piece of opala” (and I’m guessing Dave hasn’t screened the rise/shine spoof, the DCCC Djou hit pieces, the spliced videos trying to say Aiona hates gays or wants to go to Uganda to kill them or whatever baloney), it would appear to be a piece of self-inflicted opala given it originated with a DEMOCRAT. I guess you could fault the GOP for facilitating dissemination of this Democrat’s opinion of Mr. Abercrombie, but I don’t detect any antagonism on Shapiro’s part towards this Democrat. The real problem after the elections is not the campaign rhetoric, but the kind of legislation and execution of the laws about universal health care, resolutions against the longest war, multi-member districts and reapportionment, getting our teachers to teach and students and parents to learn, resolutions helping the Feds define war powers (it’s imperial America and the Praetorian Gurd now), dissuading people through the “bully gubernatial pulpit” to not spend more than they can afford,and re-learning how to live together.